Let me tell you a little about an interesting global club called WarmShowers. It is visible as a website dedicated to servicing cycling tourists. It puts cyclists in touch with people who might be willing to provide free services to them as they travel about. I joined WarmShowers a few months ago, just to try it out, and thinking "Who knows, but one day I might get in to touring this way and might be glad of a welcoming stranger somewhere along the way". There were a couple of contacts that did not result in stays. Then I got a message from Bert, mid-fifties Dutchman, who is touring with his wife Christine. 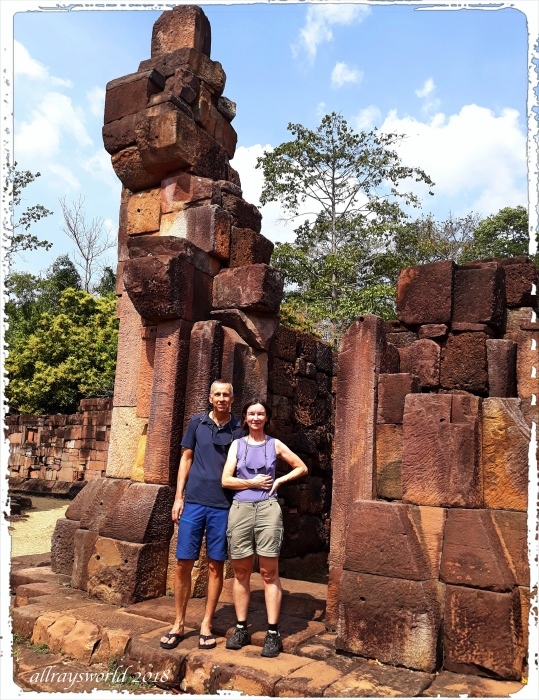 This led to us having house-guests for two nights, and I gave them a RaysTours glimpse of Surin Province by motorcar while they took a day of rest. Their visit was a delightful experience...informative and entertaining both ways. Bert and Christine had already been on their bikes about 1 month, traveling about 1500km through Cambodia and Thailand. Christie is now returned to Netherlands to work, while Bert is continuing on his bike for another 11 months, taking in New Zealand and then riding North through China then West through Tajikistan, Turkmenistan, etc, Iran, Turkey, and finally back to Netherlands. "Bert and Christine stayed with us for 2 nights. This was our first experience of hosting WarmShowers cycle tourists...Bert and Christine met my Hopes and exceeded my Expectations as guests, being sociable, polite, thankful, and were entertaining and informative with their stories relating to cycling. It was great to spend time with such friendly and capable cyclists and good people." and we make contact with Ray Storey, a member of Warm Showers. Our first experience with Ray and his wife Na was very satisfying. on the border with Cambodia, including Ta Muean. And Na cooked delicious Thai. Finally, Ray cycled a lot with us so that we could pick up our planned route again. Ray, this is just a beautiful family photo! And I can't believe how tall Marwan has become!!! What a great thing the WarmShowers is... Congratulations and thanks for sharing! Ray: It was a very strong positive for all concerned, Elizabeth. What a great idea, Ray!!! I especially like that you took photos of each other. And if that's Boy, man alive, he sure is growing up! Ray: Mawin [Boy[ has shot up enormously in the last 6 months, Ginnie. Ray: I expect we will do this again from time to time, Lisl. Who know...maybe there will be reciprocity some time in the future. Ray: I am reminded of the kindness of you and Chad to me a couple of years ago, Chris...built an indelible, positive memory in me! Oh, what a nice image of the Ray family - and what a wonderful experience to have met Bert and Christine! Oh, I admire those passionate bikers, esp. Bert and his plans -and he ist not the youngest man! Ray: It was an excellent experience, Philine...I think you can learn a lot from meetings like this. Bert and Christine are both strong, fit and capable, even though the trip is challenging. What a wonderful family picture this is and what a story of Christine and Bert. What an opportunity to grab to make this trip!!! Ray: It was good to meet open, friendly, interesting people in this manner, Astrid. Ce fut surement un grand moment de partage et découverte ! Ray: C'est une très bonne description, Claudine. Oh wonderful! I love the name of the group as it sums it up what they can expect as a minimum, more a specialised Airbnb, I suppose. What an experience that the two of them had. I like the family portrait but surely you have omitted many of the family members. Ray: The rest of the family seemed a little over-awed at having strangers welcomed into the house, Alan...Na and Mawin enjoyed the experience, as did I.
WarmShowers is a great concept...lets hope it avoids the trap of being commercialised. That is a very heart warming tale Ray. I like your family snap. Ray: Come and visit, Chad...RaysTours will have a special itinerary for you. This is a very interesting post. A great way to meet people of like interests. It was an interesting and totally positive experience, and I hope WarmShowers continues to work this way. This is a great post Ray, you may now be far apart but it seems to me those days will stay with both your family and Bert and Christine for a long time. I note Mawin is nearly as tall as you now. Ray: It was a memorable experience, Brian...totally positive. Dutch and cycling... i am not surprised a bit, Ray. Ray: Fits together, doesn't it, Ayush. I read all of this as it was so interesting. Well done Ray! Ray: Very good, thanks, Bill. Ray: The cats seemed very taken with Bert...all of them seemed to like him, Larry. That's a wonderful photo of your family, Ray. I can imagine you would be the perfect host. Ray: Bert and Christine were excellent guests, too, Mary. Ray: Mawin has grown a lot in the last 6 months, Tom. Mek [cat] was keen to go to Bert, who seemed to be attractive to all our cats. Ray: You are very kind, Peter. an interesting experience all round, you were so kind to open your door to complete strangers. Ray: A positive experience, Martin, so I expect we will do it some more.